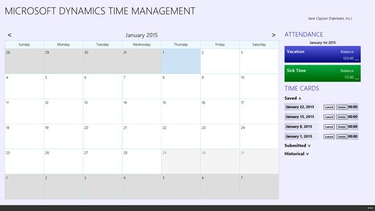 The newest version of Microsoft Dynamics GP includes a new time-management app. The global ERP software market is expected to reach $41.69 billion by 2020, according to Allied Market Research, representing a compound annual growth rate of 7.2% starting in 2014. Roughly 47,000 companies worldwide use Dynamics GP, according to ERP Software Blog, a site for Microsoft Dynamics partners, making it Microsoft's second-most-popular ERP offering behind only Dynamics NAV. By comparison, about 40,000 companies use Microsoft Dynamics CRM, according to the blog, which attributed the figures to a Microsoft official.